Because of its three dimension structure and ability to “loft”, each down cluster traps more air for its weight than any synthetic. Every ounce of quality down has about 2 million fluffy filaments that interlock and overlap to form a protective layer of still air that keeps warmth in and cold out. Because of its resilience, you can scrunch it up or flatten it out and it will still bounce back to its original shape in order to maintain its warm and fluffy properties. Feathers are light and the principle covering of birds. They have a very strong structure, and primarily enable birds to fly, while warmth is a secondary value. This is because feathers have a flat two-dimensional construction. They have a tubular quill shaft from one end to the other, and are unable to trap air effectively and therefore they have limited insulation value. Feathers are strong, as the result of a central vein, but have reduced softness value. Down is the undercoating of waterfowl. 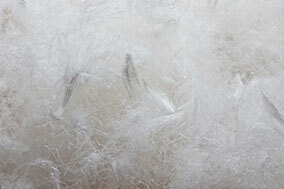 It consists of millions of light, fluffy filaments, growing from a central quill point. These stringy filaments interlock, creating a three-dimensional structure which traps air and gives down natural insulating ability. The ability of these filaments to trap air is called ‘loft’. The loft factor of down is legendary. Down has the ability to keep you warm, and dry; down wicks away any body moisture and transports it through the filaments, to the outside of the down filled product, where it evaporates. This is the reason down is so popular in the manufacturing of duvets, pillows, jackets, sleeping bags, etc. Down is naturally very fluffy and light, which is very comfortable when used in products that cover or support the body.The best down comes from a mature bird between 6 and 8 months old when the down clusters are the largest, densest, and strongest.